A spare door came with the house, I used that for the pantry with a bit of matching trim from the unseen side of the bedroom door I had to buy. I expect I should have done all the ceilings and skirting board through the whole house at this point but I'm too impatient to do it that orderly and have decided to complete (more or less) each room before I move to the next. 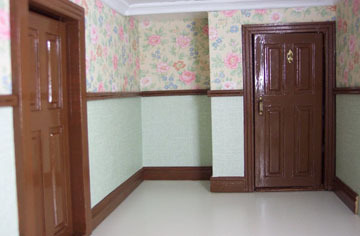 Anyway I bought the skirting and coving but the dado rail is made with a double row of bamboo skewers. 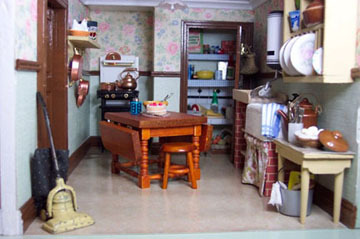 Well that's the kitchen done for now, there's still room for little extras to be added over time though. It has taken several weeks to get this far so I can see it will be many months work to do the whole house. I had the big table and the vacuum cleaner in my original house to start with but they fit in this one much better. (My son has just asked, as I am mainly having floorboards and rugs in this house why does it need a vacuum!!) . Still not sure about the floor and now it has a small damaged area at the front, might have to try replacing it at some point. 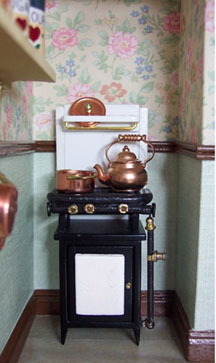 The converted cooker, does it need something on the wall above? I didn't feel able to make a cooker correctly so I bought one. It was disappointing when it arrived because it looked awful, too tall and thin and stark. I shortened and widened the back then added some painted bendy plant ties for pipes with jewellery findings for knobs and joins. Think I would have done as well building it from scratch, however I think the finished result is acceptable. Drawing on my experiences from furnishing my first house, I first made and dressed the pantry shelves before I built the walls around them. 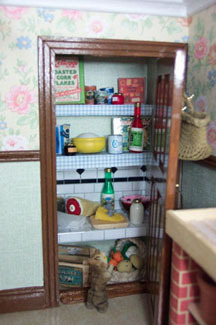 I love the pantry,I made the meat from bread dough, the crate from lolly sticks, the jelly from glue and the milk bottle from a bullet connector (from inside a car radio) with a paperclip lid. 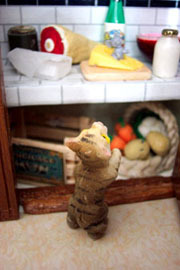 When I saw the little mouse in the cheese I had to buy him, it then took me weeks to find a suitable cat to set the scene. 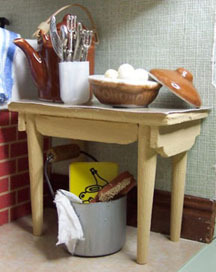 The small worktable beside the sink. The original idea I had was to put a chair next to the sink but it didn't look right so I made this little table with offcuts of wood, the legs are the tapered ends of some bamboo chopsticks. At last I have attempted using Sculpey clay, a new medium for me. I made the eggs in the bowl and the brush in the bucket, the bucket is a painted container lid with a wire and bead handle. The yellow thing inside the bucket is actually a mini cookbook, I will replace it with a cleaning product when I make one. 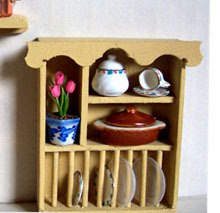 The plate rack which hangs on the wall above the worktable is a kit bashed Michaels hutch, you can see how to make it here. 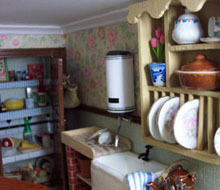 The costliest thing about the sink unit was the tap, the sink is mainly foamboard, soft plant ties and paint. The uprights are also foamboard covered in brick printed paper. Wood offcuts and lolly sticks made the shelves and draining board, I got the ridged effect on the drainer with the thick wallpaper I used on the stairs in my other house, it was just a sample piece and has been very useful.